WEKAPO stuff 'n sit stuffed animal storage bags offer a perfect solution for your family. Little ones will enjoy having their own special seat with their animal friends close. will love having them stored in a comfy seat that is both decorative and functional. They come in 8 lovely variations to blend beautifully with any bedroom decor. and another for a friend now. It makes a fabulous gift! KIDS FRIENDLY DESIGN - Our storage bag has 48" long YKK ZIPPER that is not only easy for your children to access their plush toys but also easy for their fingers to zip the toy bag closed. It also has a handle on top for ease of pulling around and moving, which is great for busy kids. 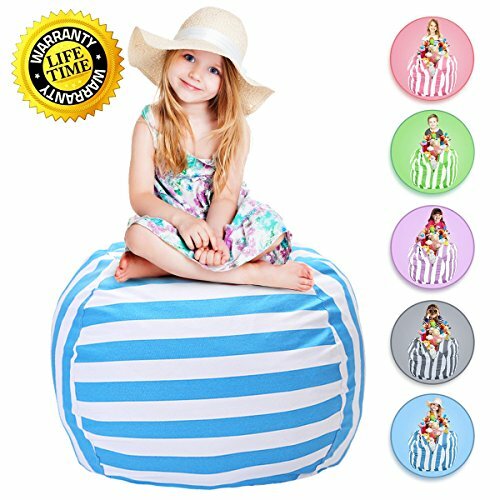 100% SATISFACTION GUARANTEE - WEKAPO Stuffed Animal Storage Bean Bag Chairs come with a 100% Satisfaction Guarantee. WEKAPO is dedicated to address any product/service issues and is committed to delivering a 5 star experience for all buyers. If you have any questions about this product by WEKAPO, contact us by completing and submitting the form below. If you are looking for a specif part number, please include it with your message.